Case IH isn’t the only tractor maker with a cab-less vehicle. 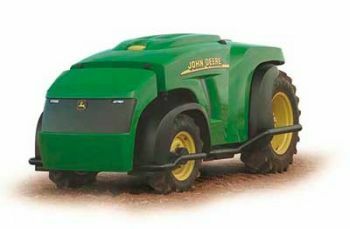 Deere has had two iterations of their cab-less concept tractor which has received much attention but resistance in buying. Autonomous Tractor Corp. has their SPIRIT driverless tractor, Fendt, an AGCO company, has their GuideConnect follow-me style system where a lead driver can have many following vehicles. Certainly, there are advantages to the use of these types of autonomous tractors. They are lighter and will, therefore, reduce soil compaction; they cost much less – one Deere engineer said that cabs, air conditioning, controls and monitors, and other creature comforts in those cabs, often add 50% to the overall cost of a tractor; and one operator can control many of these new tractors; etc. Case IH autonomous concept vehicle in action. There are also safety, liability, insurance and legal complications that will need to be handled before this type of farm vehicle can become commercially available. And public acceptance of this type of tractor hasn’t happened yet. There are no buyers. The new Case concept tractor comes equipped with cameras, radar and GPS, and remote operating software enabling farmers to remotely monitor operations through an app on their computer, tablet or phone. 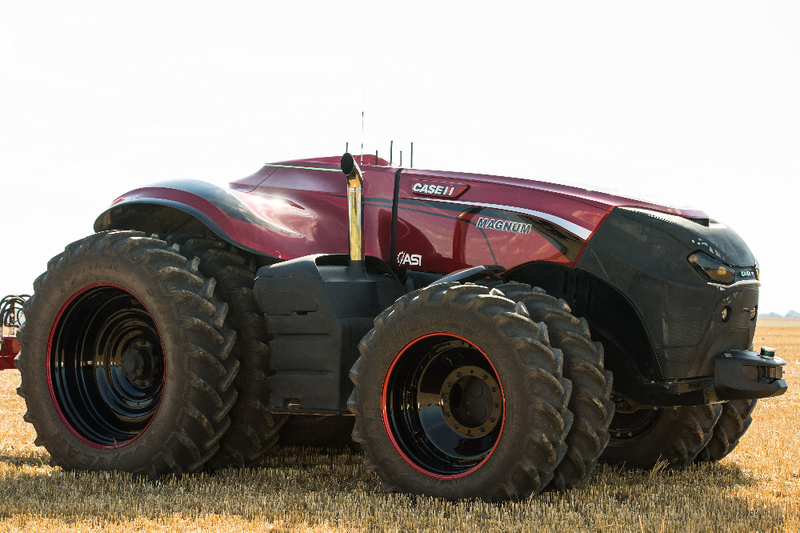 ASI (Autonomous Solutions Inc.), a Utah provider of mobile robots, platforms and navigation systems, partnered with Case in the development of Case’s new cab-less tractor. 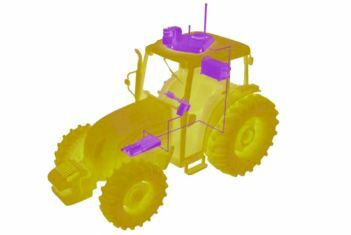 ASI’s Mobius navigation and collision-avoidance system – included in the new tractor – is already being used in the mining industry. ASI also makes self-driving kits to retrofit tractors and other vehicles. 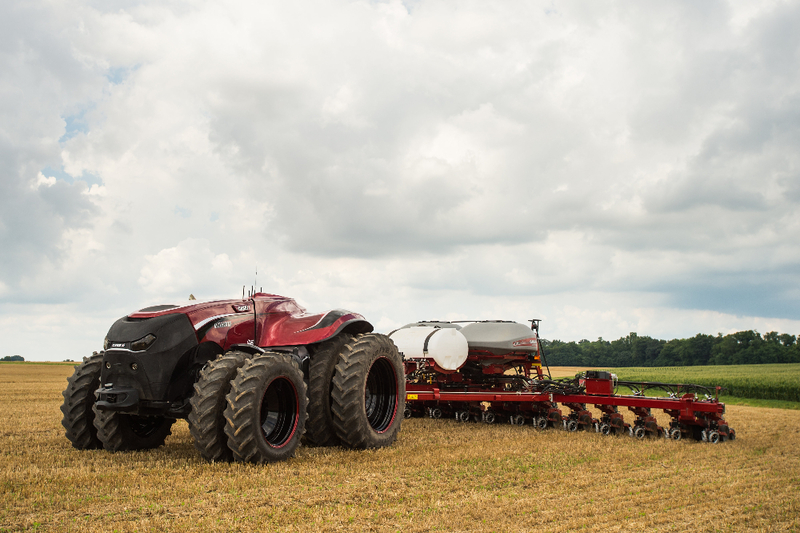 “There are no federal rules specifically addressing self-driving tech for tractors, largely because farm equipment is designed for use in fields where it doesn’t pose the same level of risk to other vehicles or people as a self-driving vehicle on a public road. The closest thing to national regulations are safety standards set by the Occupational Safety and Health Administration, but the agency does not have any rules directly aimed at self-driving technology. As new technologies begin to impact farmers – and younger, more digitally adept farmers take more control over their farms and their data – the merits of cab-less tractors and the ability to operate them remotely will finally begin to make fiscal sense. Perhaps as early as the next decade.